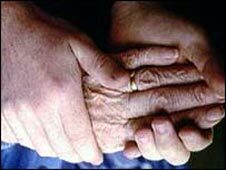 Concerns are being raised about end of life care in England. The National Audit Office (NAO) said services were not meeting the needs of people. What is the problem and what are the solutions? The term covers a broad spectrum of services. It is applied to the treatment and support given to terminally-ill people. About 500,000 people a year die in England, two-thirds of whom are over the age of 75. The majority of deaths occur in a hospital following a period of chronic illness such as heart disease, cancer, stroke or dementia. During the last days, months and even years of life people will come into contact with a range of services that could be classed as end of life. This includes everything from specialist palliative care - to relieve suffering from life-threatening conditions - to visits by GPs and nurses at a person's home. In a nutshell, too many people are ending their days in hospital when they want to be elsewhere - at home, in a care home or a hospice. It typically happens because in the last stages of life managing death becomes too difficult for the person dying and for their family. It maybe that they need relief for pain or some extra nursing care that is not available, so they are forced to go to hospital. The NAO pointed out that front-line staff lacked training, while funding for services varied enormously. There is also a lack of co-ordination between council-run social services and the NHS: Both are involved with different elements of the care package. The government has already recognised that there are problems. Ministers published a strategy in the summer aimed at improving services. They promised nearly £300m of funding to help set up rapid response teams in the community who will respond to emergencies from those in the final stages of life. The NAO is not entirely convinced this will work, pointing out there is a lack of time-frames and commitment to support the NHS over this. Campaigners also point out that services are drastically under-funded. For example, hospices are said to provide a vital role in end of life care. They require £500m a year to keep afloat, but receive just over £100m of that from the NHS. Although the NAO report was just concerned with services in England, similar problems can also be found elsewhere. Campaigners have said that a lack of community support for families is an issue across the UK. And the devolved administrations have also recognised this. Both Wales and Scotland have published end of life strategies, while Northern Ireland is currently working on one. All are focusing on giving people more choice over where they die.